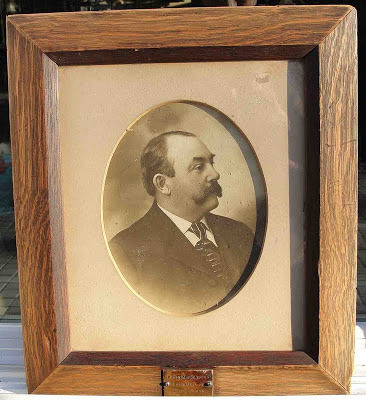 Note: This post was amended on 15 December 2012 to add two images of a framed photograph of Edwin M. Johnston supplied by a reader, as noted in the comments below, and to add some family history information. 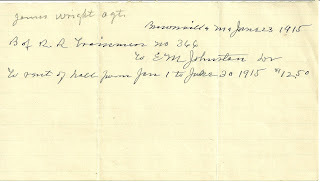 Invoice for the rent of a hall by the Brotherhood of Railroad Trainmen No. 366 from January 1 to June 30, 1915 - $12.50. Brownville, Maine, June 23, 1915. Brownville is located in Piscataquis County. Within Brownville is the village of Brownville Junction, an important railway junction. Names on the invoice include James Wright, Agent; and E. M. Johnston. I believe James Wright is the trainman, and E. M. Johnston is the lessor. I find a James Wright in Brownville, Maine, working for the railroad. He lists his occupation as Conductor on the 1910 and 1920 Censuses for Brownville. He may have died sometime during the 1920s, as his wife Agnes is living with her daughter and son-in-law, Inez and husband James M. Taylor, by the enumeration of the 1930 Census for Brownville. James and Agnes were both born in Canada in the 1860s. They married, according to the 1900 Census, in 1891, about the time of their move to Maine. 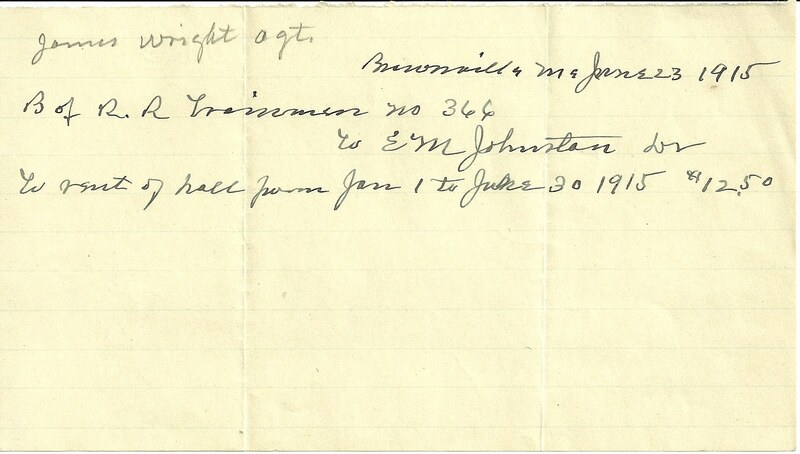 E. M. Johnston is probably Edwin M. Johnston of Brownville, who operated a store (1880 Census), was a landlord (1900 Census) and was a member of the Maine Board of State Assessors (1910 Census and at least through the year 1914, thanks to information supplied by a reader). He was born at Orono, Maine, on 4 April 1845, son of Moses and Betsey L. (Snow) Johnston. On 27 May 1866 Edwin married "Annie", born Arianna Drew, daughter of Thomas J. Drew and his wife Dolly, Dorothy (Trundy) Drew. Edwin and Annie had at least one child, a son Edwin born about 1873, who raised a family of his own. If you have any information on James Wright or E. M. Johnston, I would love to hear from you. I have a photograph of Edwin M. Johnston, in an oak frame, with a brass plaque that is engraved "Edwin M. Johnston, Brownville 1909-1915. If you wouldn't mind photographing your framed photo of Mr. Johnston, I'll incorporate it into the post for the benefit of relatives who might happen by in the future. My email address is in the right column. Thanks for adding your comment!